Here is the first extensive collection of early tango music ever published outside of Argentina. This anthology presents 42 facsimile piano scores in a wide range of tango styles found in 19th century Argentina and Uruguay. Selections include classics by the most famous guardia vieja ("old guard") composers, written during the tango's formative years between 1900 and 1920. Many of these pieces evoke musical parallels with American piano rags of the same era. These wonderful early tangos embody the full emotional depth and rhythmic complexity of this fascinating genre, yet are accessible to players of varied abilities. Appropriate for a moderately advanced player. I believe the tango will be remembered as one of the 20th century's most important musical innovations — perhaps on a par with ragtime, jazz, and rock-and-roll. If you're astonished by the first claim, please withhold judgement until you've played through the gorgeous, intriguing music in this volume. 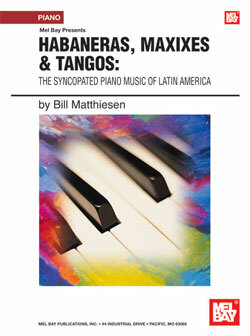 This collection showcases the syncopated piano music of Latin American during the 19th and early 20th centuries. It features Latin rhythms, which are really African rhythms brought to the Americas by slaves and applied to the music of the European colonists. These rhythms are varied and complex and so is their history. They've had a widespread and profound influence on the evolution of popular music, not only in Latin America but also in the United States. The most obvious offshoots are the tango in Argentine and Uruguay and most of the other popular dances of South and Central America, as well as ragtime and jazz in the United States. Jelly Roll Morton claimed this "Latin tinge" is the essential element that distinguishes jazz from ragtime. These rhythms are the musical roots of groups like "The Buena Vista Social Club." Includes works by Ignacio Cervantes (Cuba), Manuel Saumell (Cuba), Juan Morel Campos (Puerto Rico), Jose Quinton (Puerto Rico), Ernesto Nazareth (Brazil), Tomas Leon (Mexico), Sebastian Yradier (Spain), Eduardo Sanchez du Fuentas (Cuba), Will Tyers (USA), Vincente Greco (Argentina), Anselmo Rosendo Mendizabal (Argentina), Angel Villoldo (Argentina), Eduardo Arolas (Argentina) and Juan Maglio (Argentina). Pieces range from intermediate to moderately advanced. 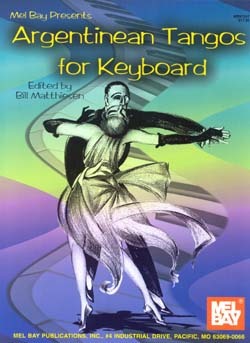 Contains 25 habaneras, 7 maxixes (Brazilian tangos) and 5 tangos; 96 pages. … The most interesting and influential syncopated compositions came from Cuba, Brazil, Argentina, Uruguay, Puerto Rico and Mexico. The most important genre was the habanera... meaning "from Havana." The term described a basic rhythm, rather than any specific dance or musical structure. It's the same rhythm now associated with the tango from Argentina…. It's interesting to note that the word tango was associated with this habanera rhythm 20 or 30 years before the birth of the Argentine tango in the 1870s.